A.C.T. 's M.F.A. Program 2016 Production of Love and a Bottle. Farquhar, in his own time, was challenging the story that we tell ourselves that “boys will be boys” and women are property. Farquhar saw that and turned it on its head, taking it so far that we are shocked by the violence and the abuse. It reminds me of when I was a kid, hearing the old fairytales about the idiot who finds the golden goose and gets the princess, while she has no say in the matter. Or how Cinderella wins a prince at the ball based on her beauty alone. But we understand now that this is not okay. I think it’s amazing that Farquhar in 1697 was essentially questioning the fairytale that everybody was putting onstage at that time. 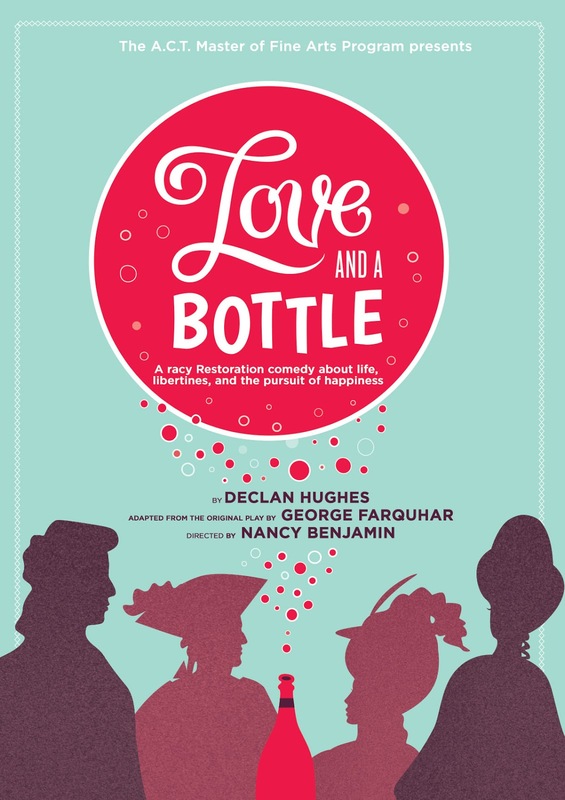 Can you describe the heightened language and style of Love and a Bottle? With heightened language we need to get rid of all notions of style. Because style leads us into false play, causing us to present attitudes rather than people. One of the things I loved about the production that I saw was the rawness and the immediacy of all the characters. They were completely modern—the only difference [between them and us] was their word choice. The characters say things in a way that’s different from the way we would, but the actors find the energy of that speech without adopting a tone or a style of playing. My goal is to get rid of style so there is no separation between the play’s world and our world. How do you differentiate between the two worlds: the world of Farquhar’s protagonist, Lyrick, who is a young dramatist struggling to write a play, and the world of the play he himself creates within Farquhar’s play? This is the central challenge of this play. We’ve placed Lyrick on a different platform from Roebuck and the other characters he creates, so when he’s describing the action, those characters enter the space and he tells them what to do. We’re trying to establish for the audience that this man is creating the characters we see. When his landlady comes in, she walks through all of those characters without seeing them, making it clear that the world he’s imagining is not the real world. The play that Lyrick writes remains unfinished in some ways. Why do you think that is? He has to stop the story. The story is wrong. That’s the big message we want to convey: Roebuck takes control of the story, and Lyrick realizes it was the wrong story to tell. We just don’t tell stories about women being abused and abandoned. We don’t tell stories about betraying men and calling women whores. If we try, we realize that we’ve messed up in a big way and the story should not, and cannot, be finished. Love and a Bottle is playing October 5–8 at The Rueff at The Strand Theater, 1127 Market Street, San Francisco. Click here for tickets.